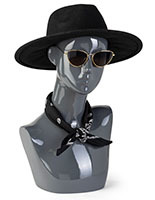 Want to display wigs, hats, or other accessories like sunglasses closer to your customers? These mannequin heads sit on counters or tables and provide people with hands-on shopping. Full-size dress figures can do the same thing but now all the customer attention is focused on the head alone. 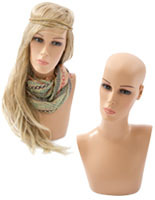 These mannequin heads are excellent choices for wig suppliers as well as department stores. Beauty counters that sell accessories not only have an easy way to highlight certain items but they also provide decoration that draws customer interest. While these mannequin heads are not really designed for training cosmetology at beauty schools, retailers make good use of them for merchandising. What sort of products can be shown on these display forms? 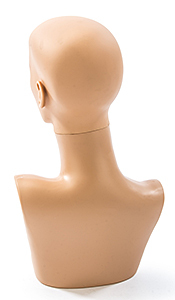 Wigs on these mannequin heads make up the primary use and are most effectively displayed on the lifelike female models. Placed at eye level, these hair displays offer a close up presentation that the shopper can inspect 360° in the round. Hats are popular purchases throughout the calendar year. Give your customers an idea how they look on the head while providing the irresistable impulse to try one on. 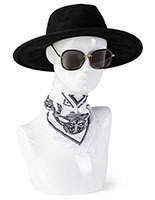 Clothing & accessories round out the list with numerous ways to merchandise to shoppers. 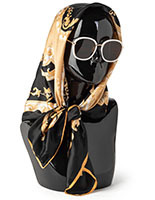 Use these display forms to offer head scarves, sunglasses, and jewelry such as necklaces. When placed on a retail counter or as a table centerpiece, retailers have the tools at hand for creating attractive displays that lure customers inside your establishment. Our wig displays are manufactured from polypropylene and come in many different finishes. The realistic bust is well suited for hair pieces while the other stylized models with simplified features make excellent choices for offering accessories. These styles are available in glossy white, bronze, and black.